Local No. 584’s predecessor was Local No.191. It was chartered in Tulsa, Oklahoma, sometime during the Great Depression. However, due to the economic hardships of the era and the trusting nature/kindness of the time’s Business Agent, Fred Graham, Local No. 191 had its charter revoked by the International Association because of the debt it had incurred by allowing members to purchase their dues stamps on credit. Local Union No. 584 was chartered by the International Association on April 8th, 1938. Brother Fred Graham was appointed ‘acting’ Business Agent. The International Association would not allow him to become the actual Business Agent because of the past financial problems of Local No. 191 under his watch. R. W. Brown resigned as Business Agent on this day. He had contracted tuberculosis. M. G. 'Blackie' Steele was appointed to serve the remainder of Brother Brown’s term. However, on April 14, 1939, Clyde B. Judkins, a General Organizer for the International Association, took over as presiding officer. This lasted until sometime between the 5th and 24th of October 1939. During that timeframe, W. L. 'Bill' Mills was appointed Business Agent. On this day, devastation struck Eastern Oklahoma. The city of Pryor was almost completely wiped off of the map by a tornado. The Weather Bureau reported the cost of the damage to be around $2,015,000.00, stating that this was the worst tornado of 1942. The Red Cross reported 52 deaths and 181 treated for injuries. The Union’s Executive Board meeting for that day was canceled so that the officers could, along with several of the members, go to the aide of the injured and help with the clean-up of debris. At the International Convention of 1952, all outside local unions (shopmen belonged to 'inside' local unions) were ordered to establish an Apprenticeship Training Program. Local No. 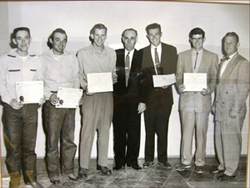 584 began its Apprenticeship Training Program in 1953 as a 2-year program under the direction of Jack Price, who was Business Agent at the time. Classes were held at the Union Hall one evening each month. The first apprenticeship class graduated in 1955. Sometime between 1946 and 1953, while LaVerne 'Smitty' Smith was the Business Agent, the officers and membership felt that the Union was on firm enough financial footing to purchase a building to use as a hiring and meeting hall. The building purchased was at 432 N. Boston. It has since been torn down, and I-244 passes directly over where the building used to stand. It was located across the parking lot, to the north, from the Cain's Ballroom. Prior to this, the official address and location for the meetings was the Tulsa County Courthouse. In 1965, through negotiations with the signatory contractors, the members of Local No. 584 were able to start a Health and Welfare Fund. This was the first benefit ever received by the Ironworkers in this Local Union. The fund was started with $.10 (ten cents) per manhour. In 1966, during one of Robert F. ‘Red’ Arric’s terms as Business Agent, the Union Hall moved. Fleming Construction, a signatory contractor at the time, erected a Butler pre-engineered metal building at 7602 E. 46th St. in Tulsa. This decade brought some good changes for the members of Local No. 584. The Apprenticeship Fund was started with $.04 (four cents) per manhour. The first 3-year election was held, and the membership voted to join the Ironworkers Mid-South Pension Fund. On July 1, 1970, the pension contribution was started with $.15 (fifteen cents) per manhour. Then, in 1971, the newly funded Joint Apprenticeship Training Committee (JATC) bought land to build a training facility. It was located about one mile to the east of the Union Hall at 8620 E. 46th St. On June 1, 1974, the members voted to start a Death Benefit Fund. This fund, for the members who chose to join it, would help relieve the financial problems of their loved ones after the member passed away. The 1980s started out with a bang. As work was good throughout most of the country, Tulsa was no exception. Local No. 584 started an annuity in 1980 with $.50 (fifty cents) per manhour going into the fund. In 1982, there were 1300 Union Ironworkers working in this geographical jurisdiction. The Local had about 980 members. Then, Reaganomics and the oil bust both caught up with Tulsa, and work stopped – period. Within 3 years, the membership had taken a $2.00 per hour cut in their wage and benefit package. This was in an effort to make the signatory contractors more competitive in the depressed market and allow them to secure work for the Ironworkers. This is viewed by most members in the Local to be a mistake. Part of the cut included the loss of the annuity started just 5 years before. Things started to turn around a few years later. Work began to pick up, and as a result, money began to flow back into the Local Union. In 1993, an annuity was again started with $.75 (seventy-five cents) per manhour. In 1994, Local Union Newsletter (pictured below) was started to keep members informed of important dates and information. An annual picnic and pin ceremony was started in 1995. In 1996, the membership passed a targeting fund as a means of trying to recover some of the lost market share of the 1980s. Also in 1996, Brother Jerry McClain, a second generation Ironworker out of Local No. 584 with sons who later became members, carved a ‘Tribute To The Trade’ statue. 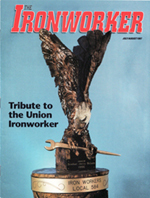 The statue was featured on the cover of The Ironworker Magazine (pictured below) and is in the lobby of the Union Hall for all to view. In 1997, the JATC bought 1.5 acres and hired Williams Construction, a signatory contractor, to build a new training facility at 14712 E. Pine St. in Tulsa. It had outgrown the old location, and the new site had potential for more than just the Apprenticeship Program. The members volunteered countless hours to help reduce the cost of the building. By 1998, the Death Benefit Fund, due to its voluntary nature, was in danger of going bankrupt. The officers and members took action and voted to make the death benefit mandatory. The hall moved again in 1999, this time during one of Harvey A. Swift’s terms as Business Manager. The Local Union bought .75 of an acre from the JATC. Just like the JATC previously used Williams Construction and volunteer labor, a new hiring/meeting hall was built at 14716 E. Pine St. 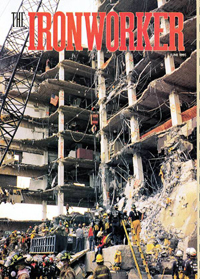 The year of 2001 was a busy year for the Union Ironworkers in Tulsa, Oklahoma. We cannot mention the year 2001 without expressing sympathy for all of the Americans who were killed by the senseless destruction on September 11th. We would like to thank all of the Ironworkers, from across the country, who traveled to Ground Zero and aided in the recovery and clean-up effort. Oklahoma became a ‘Right-to-Work’ state on September 25th. Also in 2001, the members took action again to save the Death Benefit Fund, voting to increase the benefit and the assessment to prevent it from becoming obsolete. To help the families of members, a Local Union scholarship endowment was started. In 2005, Local Union No. 584 became signatory to Ironworker Management Progressive Action Cooperative Trust (IMPACT). We the members of Ironworkers Local Union No. 584 would like to humbly take a moment to thank all of the men and women who have given of themselves in service to this great nation. Whether they served in a time of peace or war, whether they lost nothing but time away from their families, or whether their loss was greater, such as a loss of limb or the greatest sacrifice, the loss of life, we thank you all. 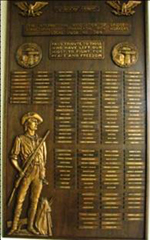 In 1943, our Executive Board recommended that a plaque (pictured below) be “bought and placed in the Union Hall for the members in service.” The names of our brother Ironworkers who left home to fight for their country in World War II were memorialized on this plaque. It “pays tribute to those who have left our midst to fight for peace and freedom.” Later, the names of the brother Ironworkers who had gone to fight in Korea were added. Unfortunately, the plaque is not large enough to place all of the members who have served this country and defended it from all enemies, foreign or domestic. Instead, we hope that this webpage will allow us to properly thank them all for their sacrifices and for their patriotism.